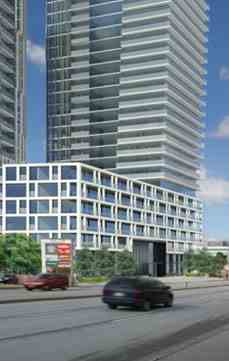 Edenshaw Developments Limited has proposed a mixed use development which includes two high-rise towers and a 6 story podium, containing retail units, fronting Hurontario with low-rise townhouses along Grange Drive. It has been designed as an iconic landmark to act as a marker both during the day and at night. 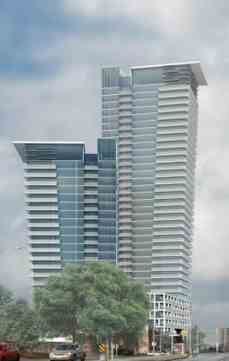 The proposed towers are 36 storeys and 22 storeys in height with the north tower being taller and closer to Hurontario and the south tower being lower and significantly setback minimizing the overlap between towers; designed to provide a visual break reducing the bulk of the building and also reducing the impact of shadows on adjacent lands. A well landscaped multipurpose courtyard with pedestrian and vehicular access from Hurontario serves as the heart of the development and is the focal point around which the building components are arranged. Access to the underground parking for residences is discreetly located past the courtyard at the north end of the site. The 3 story townhouses fronting Grange Drive are back-to-back with units on Grange which are wider than townhouse developments to the south and narrower townhouses facing inward to the courtyard. Parking for the townhouses will be provided below grade with an elevator and stairs leading to a common corridor to provide townhouse residents’ access to their units at grade level.